Hilltop Community Church, Albany, Wis. The people of this outgoing and lively congregation in southern Wisconsin definitely care about their community and their neighbors across the world. 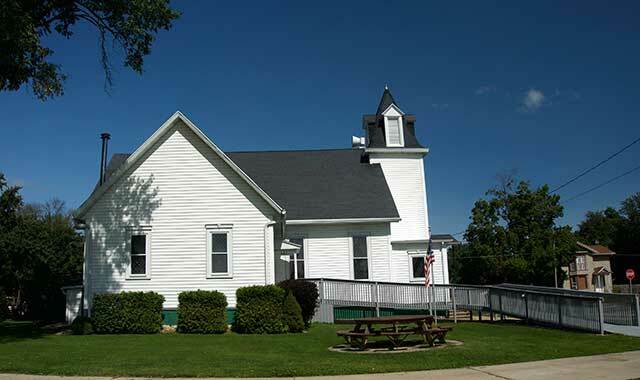 Founded in 1867 as a non-denominational Christian congregation, church members live in Albany, Monroe, Brodhead, Janesville, Beloit and other surrounding communities. The congregation serves its neighbors in need around the globe by sending supplies to Saint Lucia, Madagascar, Tanzania and other places. The church also supports Family Promise of Green County, which helps to transform the lives of homeless families by providing three meals a day, social support from volunteers and overnight accommodations, among other things. If a member of the church is in a nursing home or is a shut- in, church members create cheer boxes for them. The boxes may include Kleenex, a small gift item, lip balm, word puzzles or playing cards, among other things. Visitors are always welcome at the church and won’t feel out of place if they don’t dress up, because at this church, the attire is casual. Services are traditional, with scripture readings, prayer time and congregational singing. An adult Bible study takes place at 9 a.m. Sunday mornings, and Pastor Ray Jewell leads a worship celebration beginning at 10 a.m.
Children’s Sunday school takes place at 9 a.m.
St. Paul’s Episcopal Church, DeKalb, Ill. Some people believe this uniquely shaped church looks like a stylized barn silo, due to the agricultural history of the area, while others see it as an upside down ship or ark. There are some who also view it as a covered bridge, with the portals leading to the altar of God. This is what architects had in mind, according to the perish history books. No matter how you see it, St. Paul’s Episcopal Church in DeKalb got its start in the 1850s. The first building was created in 1881 and the current church, which was built in 1967, is the church’s third building. It’s footsteps away from Northern Illinois University. In 2000, a fellowship hall was built on the southeast side of the church. It came equipped with a kitchen, large gathering room, a nursery and parish offices, among other things. This may be a small congregation, but it plays a large role in the community. The church puts on an annual lobster boil and, as part of the decades-long tradition, donates half of the proceeds to local charities that help those in need, including Hope Haven and Safe Passage. The congregation also plays a role in helping those in need during the holiday season. Among other things, church members help organize and collect food for Thanksgiving food baskets, in coordination with the Salvation Army. The church holds an adult Bible study Sunday mornings at 9:15 a.m. A holy Eucharist takes place at 10:30 a.m.
From September to May, a children’s Sunday school is offered at 9:30 a.m. This entry was posted on Monday, October 9th, 2017 at 11:57 am	and is filed under Mind & Spirit. You can follow any responses to this entry through the RSS 2.0 feed. Both comments and pings are currently closed.